Last weekend I spent an afternoon with velonaut Richard Bloodworth and Laid Back Bike’s David Gardiner trying out the Milan velomobile. That’s me, doing a little under 33mph on a flat bit of road towards the end of my second 10km “time trial” up this section of dual carriageway… thanks to David for capturing this footage! It’s only fair to be up-front and say that I can’t really ‘review’ the Milan in the same way as the many recumbents I’ve compared on this site to date. For starters the Milan is the only velomobile I’ve so much as sat in, never mind ridden. At least the sitting part might change when Edinburgh gets its first carbon Quest later this year but even so, I think a huge period of adaptation would really be needed to do these remarkable vehicles justice. This piece should really just be taken at face value as a short insight… you have been warned! 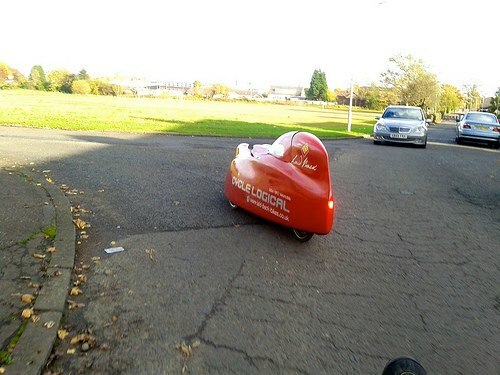 The Milan velomobile doesn’t feel fast. Actually it’s quite a fast mover, with Richard equalling his Fujin SLII commute record in the first couple of trips – but only your speedo will tell you how well you’re doing. If you turn up for a test ride make sure you can measure speed somehow before feeling underwhelmed! The Milan’s handling is a challenge, at least for the uninitiated. Above 30mph on a smooth dual carriageway I almost didn’t feel able to change gear for fear of swerving, and there is significant brake steer. I’d rely on Richard for an owner’s experience of this rather than my brief exposure, of course, because an afternoon is a short time to get comfortable on anything new. Taken as a whole, the noise, heat, and general experience of riding the Milan is much more like being driving in a track-day kit car by an enthusiastic teenager than “like your family car, only with pedals” as I half expected. I won’t say that this is a downside per se because it’s all about expectation, and you won’t be fooled by a test ride here. All still images courtesy David Gardiner / Laid Back Bikes. Adjusting the Milan wasn’t too difficult because I’m shorter than Richard: we removed a section of chain and then pulled the bottom bracket in by 6″ or so (which has to be done with the vehicle on its side, via the reversing foothole). It’s not amazingly convenient but having this access clearly makes a big difference to the maintainability of the bike in field conditions. I’d think carefully before buying something which restricts access through the cockpit itself (especially as the Milan’s built-in headlights lights can’t be used to perform maintenance when the ambient light is low). Richard is pretty tall and still fits inside the Milan OK, after having tweaked his position. For what it’s worth at 5’10”, ~43″ x-seam, relatively broad shouldered and with modestly size feet (! ), I thought I’d fit a Milan “SL” easily enough – there was bags of room in this full-size version even around my shoulders. The steering lock, though limited, still allows the Milan to turn more or less in the space you’d use in an average family car – so if you can drive your route, it will be OK by velomobile. One note was that my smooth road shoes were terrible at attempting to reverse using the foot hole – which made the one three-point turn I tried, to back towards the driveway, a total failure. Something with a bit of grip left absolutely necessary (although of course you can always jump out, this isn’t a quick operation because of the hood!). Below 15-20mph the Milan is relatively placid, but as you build up speed the handling becomes razor sharp, possibly in a good way (long term owner’s report required!) but for a test ride, it was really quite intimidating. The most hairy moment came as I descended a shallow slope on the empty dual carriageway at around 40mph, when I spotted a car building up speed to join at a slip road. The natural thing to do would have been to move into the fast lane and pass them, but I felt neither able to steer or brake, so close was the Milan to the edge of its handling. This is also an issue if you have any tendency to grip the bars as you put in power – you soon won’t! By the end I had learned to partially tame this trait by pressing my arms against the inside of the fairing, and guiding the steering with a feather-light touch from two fingers. I’m hoping to hear from Richard that this, like other aspects of my test ride, is something you’d naturally grow comfortable with / out of. There’s lots of brake steer, which in my opinion is mostly something you’ll learn to anticipate but does complicate a test ride – you can see the brake steer visibly in the second “slip road” video just after I leave the main carriageway, bringing the Milan a little to the left. Potholes and other road imperfections need a careful lookout, not just because the Milan has very low ground clearance (or even because the ride quality deteriorates dramatically on a broken surface) but because, even with suspension, quite a lot of shock makes it through to the body, and of course everything is drilled into carbon fibre, from the seat mounts to the suspension struts. It’s encouraging that so many Europeans are doing very high mileages without their velomobiles cracking apart, because to the untrained ear it sounds like it’s taking quite a pummelling! Locals took a keen interest! You’re going to find the Milan either remarkably heavy or remarkably light depending on how you look at it. You could pick up a featherlight road bike in one hand and then try to do the same with the Milan on the other (you’d fail! 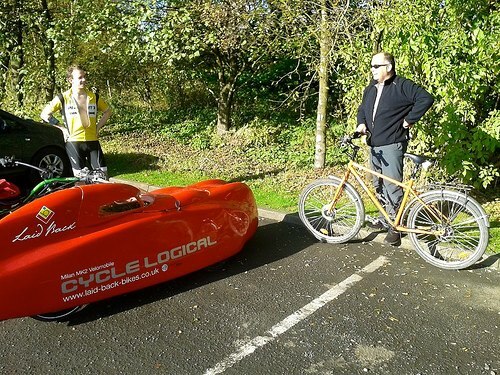 ), but on the other hand, I commute on a ~13kg upright often pulling a 10kg trailer, and then you’re only looking at a few extra kilos to make what I consider still a fast moving combination into a full blown velomobile. Compared with other velomobiles the Milan is supposed to be significantly lighter, but I can’t really comment on that based on my not-so-extensive first hand experience! The heat inside the Milan is something else. Even though the day was cool (I rode in a windproof, long sleeves and fleece gloves to and from the rendezvous), I rode the Milan in a summerweight short jersey – unzipped! At lower power output the air circulation under the visor was fine, but when I was going for it the fairing got very hot very quickly… after 20 minutes going hard it was like a sauna. Fantastic in winter, but I’m interested to know how Richard will get on next summer (luckily Scotland’s shortest season!) – lots of hydration needed I imagine! The noise inside the Milan is fearsome. Probably this could be further optimised with some more damping material between the hood and the cockpit rim, but as it is I would certainly want earplugs (or of course headphones) if I rode it regularly. It’s not so much drivetrain noise, the drivetrain being a sort of low rumble/hiss, but road surface ‘detail’ that is bouncing around the close confines like thunder. How tight you manage to get the bungee / velcro holding down the hood obviously contributed a lot to this, as my last ride was much better than the first – so perhaps I was also missing a few tricks here. Given that they can’t hear traffic while in motion you’d be right in assuming a Milan pilot won’t be making any manouvres across the road without looking behind them… and the hood makes this more than an academic question, as it restricts visibility to the forward 180 degree arc only (however, I didn’t feel visibility in the forward/side directions was compromised by the hood significantly). Indicators are built in since there’s no way at all to get your arm out in the open air! The Milan is similar in stature to a sports car like a Lotus, although of course considerably narrower. Certainly I had no fears whatsoever that I would be crashed into, and this was borne out by the reality of riding it both in village streets and on open dual carriageway. 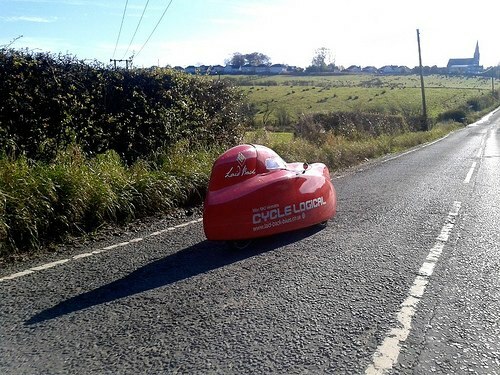 Of course, it’s quite possible that a peer of the realm may be writing text messages while driving and crash into the first velomobile (or ordinary bike, or lamp post or parked car) they find, but if they did the carbon bodywork would hardly be a disadvantage compared with an exposed human body. (Although as reported recently, it may not help if you are hit side-on at a crossroads). There’s a huge amount of friction in the drivetrain which I think probably contributes as much to the Milan’s sluggish performance at low speeds as the weight – the chain run is very long and almost entirely within tubes, and you can feel when turning the chainset by hand just how much drag that imposes. 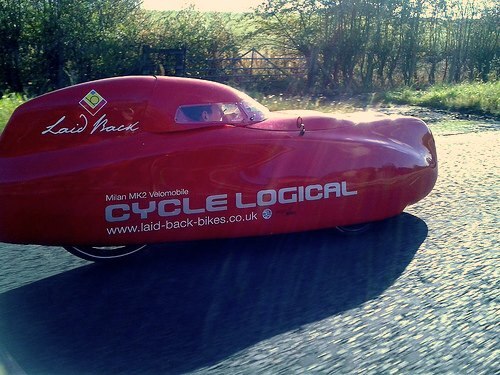 But mechanical resistance is only a small part of the story – to be fair, one doesn’t buy a velomobile to accompany joggers in the park… what happens when you unleash it on the open road? The first thing to comment on is the velo’s momentum. You’d think that the weight of the Milan would bring it rapidly down to earth when the road turns up, but in common with Richard’s own reports, I really did feel that it just kept rolling forever – only the more sustained climbs really forced me to sit in and winch up. Once speed gets much above 15-20mph the aerodynamic advantage of the Milan comes into its own, in fact after the initial acceleration effort is complete, it hardly feels more strenuous to ride at 25mph than 10mph. The main run I put in was 10km / 6 miles out and back on a stretch of dual carriageway (roundabouts at either end, but unfortunately some traffic lights too). By this point in the day I had already ridden the Milan a score of miles on local roads as well as travelling to and from the train on my Strava bike, so on top of being at a seasonal low fitness-wise, I wasn’t fresh either. Still, I was able to hold a hair under 30mph for almost a mile and a half and finished the 10km at an average of just under 25mph, again a major achievement considering the two traffic lights and two roundabouts that held me up on the circuit. There was an average gradient of just under 1% (of course, concentrated in a couple of sustained rises) which saw me freewheeling over 40mph and reduced to under 20mph on the return. All in all, I could easily picture adding 5mph onto the rolling average with time to condition myself. So there you have it – a bit of a ramble for which I apologise, but hopefully some interesting or useful observations about this singular machine! Excellent and really review. 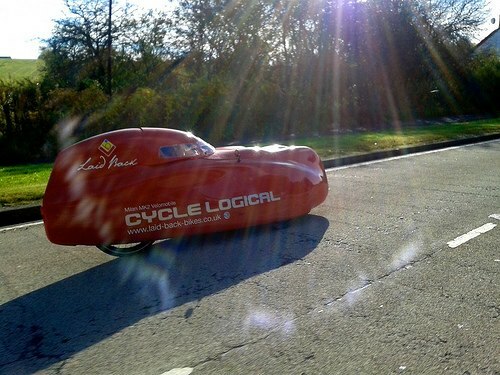 I enjoyed the objectivity resulting from not having invested heavily in buying the velomobile. The points about mechanical efficiency and noise are very interesting. Thanks for this post on the Milan. Very interesting reading and I will be making a point of reading the back posts on the build. Thanks to you and Mr Bloodworth for an excellent ‘first impressions’. You have the confidence to credit your readers with some intelligence (optimistic, but always worth a shot!) This is in stark contrast to a well known American site in which the editor starts spluttering at the merest hint of criticism of a manufacturer / product – however gently stated. 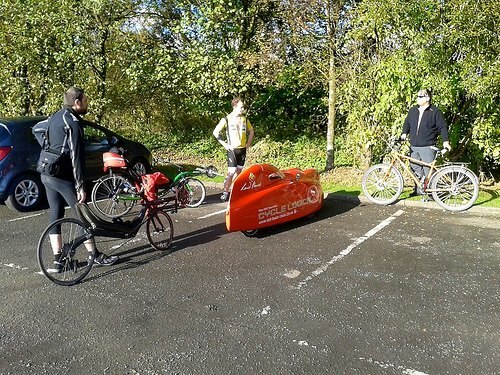 Clearly the purchase of something as different and ‘committed’ as a velomobile is a big deal. As nice as it is to see all that ‘110km downhill’ YouTubery, prospective velonauts need a little Warts ‘n All transparency too: Your articles are a great advert for Laid Back Bikes, and good journalism! For what it’s worth, I try to tell it as I see it. Very interesting. I wonder how wide rear tire the Milan SL can have? I would go for tubeless, wide tyre if I could. The Milan SL can take at least 42-559. It might take 47-559, but I haven’t tried that yet. I don´t know what rear tyre is the fastest. None of the really fast fat tyres like Furious Fred or Supermoto fits. Marathon Supreme 42-559 has really good grip but is not the fastest. I’ve used Protek Max tube for punctureprotection, that might be a bit of overkill. 28-559 Continental Grand Prix is certainly faster. But I’m not yet sure about having a narrow rear tyre when there is no suspension in the rear. 42-559 Continental Sportcontact seems slightly slower than the Supreme, so i won’t use that again. 40-559 Marathon Racer Evo might be a really good alternative, haven’t tried it yet. I have tested several different tires for the front wheels and feel I’ve tried some of the best alternatives already. So far the fastest tyres seem to be 23-406 Ultremo ZX and the second fastest seem to be 28-406 Continental Grand Prix. The Ultremos gives the best turning radius, it’s also really comfortable. The ground clearance is ok with the Ultremos, but my Milan SL is raised 3 cm in the front, or rather the wheels are lowered so to speak. I can recommend that if you’re going to use the Milan SL in the city and in areas with bad roads. 28-406 Continental Sportcontact is slightly slower than Conti GP. 35-406 Kojak is a bit slower than all of them and the turning radius gets a worse. Kojak also seem to pick up a lot of debris and gets cut easily. the widest tires you can get away with in the rear of the Milan is a 47mm wide 26″ tire. If you are racing on an excellent road surface then by all means do what the Germans do and put 23mm Schwalbe Ultremo ZX tires on all 3 wheels.however if you are touring on the UK´s awful roads then you are well advised to use a Michelin Protek max anti puncture inner tube in the rear tire and fit a 47 mm Schwalbe Marathon plus Tour rear tire and fit the Schwalbe Marathon plus Tour tires on the front wheels too in 35mm.sure you will be slower but you are less likely to cop a flat with that set of tires on board.changing the rear tire of a Milan is no fun..there is a lot of mucking about involved as the rear wheel is mounted double sided as opposed to the Quest where all 3 wheels are mounted single sided so if you get a flat on a Quest its dead easy to remove the rear tire and inner tube and simply replace both in one go without having to remove the wheel. re rear suspension in the rear of the Milan SL.good news! the manufacturers have very very recently added rear suspension to the Milan SL! basically they have taken the rear swingarm from the Milan GT and added it to the Milan SL. so there is no need to bemoan the lack of rear suspension any longer.its available! 2 rear shocks and the rest of the bits you will need..
PowerTap hub measures power at hub. This means that drivetrain losses are ignored. If for example You put 200W of power on the cranks and drivetrain is 80% efficient You will get 160W of power at the hub. The most drivetrain losses come from idler. It should be replaced with jackshaft to reduce drivetrain losses to minimum. Sounds interesting – although it’s not obvious to me why a jackshaft would be better, doesn’t the chain then have two 180 degree bends in it, rather than a modest deflection of one chain? It’s a bit beyond me I’m afraid… I’ll need to find some time to think about it! Dave – chain is working on pulling, it works on tension. If You put chain idler on it’s way the chain will try to pull up (lift) the chain idler standing on its way. Chain idler is fixed to the frame so it won’t move but bearing inside the chain idler will experience (lift) force. There is mathematical formula which allows You to precisely calculate this (lift) force. Greater the angle, more lift force and this lift force (dramatically) increases rolling resistance of the chain idler. Example for fast imagination: if You put extra 40 kg (88 lbs) of weight on Your bicycle You will increase rolling resistance of Your wheels. This will translate into losses, slower acceleration, slower cruising speed (except downhill). The same principle applies with chain idler. By bending the chain around chain idler You generate lift force (“extra weight”) and automatically You will experience increased rolling resistance of chain idler. It’s worth mentioning that almost all velomobiles have this fault (yes, I said fault). Jackshaft also generates some lift but very small as compared to chain idler. After reaching rear (final) sprocket chain is becoming loose and chain’s work is done. You can easily watch this looseness of chain on bicycles without chain tensioner. Putting chain idler on the loose side of the chain (part of the chain which “goes back” from the final sprocket to the cranks) will not generate losses. Why? Because rear derailleur has realtively soft spring. There is small “lift force” coming up from soft spring. Spring inside rear derailleur is maybe 10N? I am designing a front wheel drive with a Rohlof mid-drive and Schlumpf belt-drive system. Hopefully this will eliminate some noise and friction.